Thank you guys for all your support last week. My uncle passed peacefully on Friday, and I spent a lot time with family in the last few days. He’s been fighting a long battle over the past 6 years, so we knew this was coming. It doesn’t make things easier, but we did have some warning. Anyway, I’m back! Since I was with my uncle at the hospital on Friday, (and have yet to get my act together enough to schedule out posts in advance), I wasn’t able to type up this week’s preview post. So we’re going to do a Forthcoming Fridays Sunday instead! What I Liked: This book will never not remind me of the R.L. Stine Cheerleaders books, even though they have pretty much nothing in common. ♥ Monica. 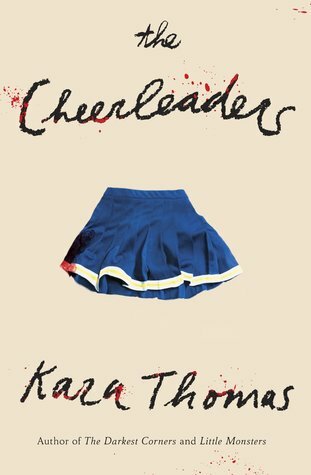 She’s strong-willed and has some problems with her parents and friends, but once she takes on the mystery surrounding the cheerleaders’ deaths, she doesn’t give up until she’s solved it. ♥ Ginny. I wasn’t sure if she was supposed to be shady or not at first, but I grew to really like her. She’s super supportive of Monica, always there to be part of her usually insane and dangerous schemes, and unwilling to let her go down alone. ♥ Two POVs and timelines, one current and one 5 years prior by Monica’s sister (one of the cheerleaders who dies that year). I liked having a view into what actually happened with Jen, because she was having a very different experience that what people thought. ♥ A twist I really wasn’t expecting at the end! What I Didn’t: I expected that this was going to be a more bloody, murder-y type of thriller. What it ended up being was a slower, sadder, mystery. It was still good, but you start out thinking the cheerleader deaths happened one way, then you start to think they all might have happened differently, they might all be connected, and then…they aren’t. One happened differently, but in no way affects the others, and it was all kind of a letdown for me. ⊗ All the names dear god why are there so many characters. Seriously there are a LOT of tiny characters thrown into both timelines that we don’t need AT ALL and it just adds more names to try to keep track of. And there were too many that were too similar. Jennifer and Julianna; Alexa and Lex; Jimmy and Johnny. Final Thoughts: It’s a good book and a solid mystery, and if you go into it with the right expectations you likely won’t be let down by the thrills that it does provide.